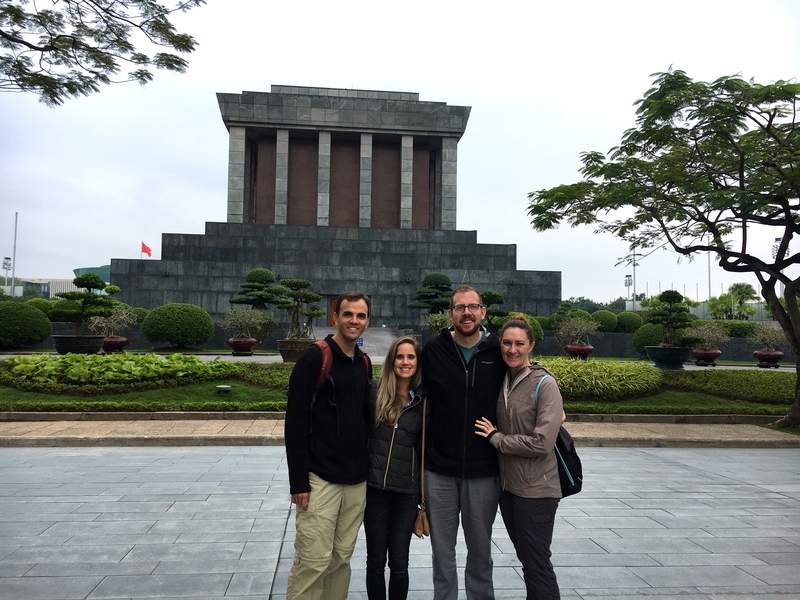 We didn’t get off on the right foot when we rolled into Hanoi a little after 5am on an overnight bus from Hue. First, it was absolutely pouring rain when the bus let us out on a random corner on the edge of town. (I am certain this is all part of the plan for these companies to pass along the tourist dollars each step of the way). Next, we were met by the local taxi driver who was kind enough to offer to use the taxi meter for our ride to the hotel in the center of the Old Quarter. We didn’t really question it and quickly climbed inside to get out of the soaking rain. Just as you may have guessed, it was too good to be true. As we neared the hotel I realized he had driven the “long way” around the city and the meter was clearly rigged to overcharge us based on the dollar amount. Sleep deprived from the bus ride into town and lacking any energy to argue over the equivalent of about $5 USD, I paid and we got out. We walked a couple minutes down the block to our hotel. 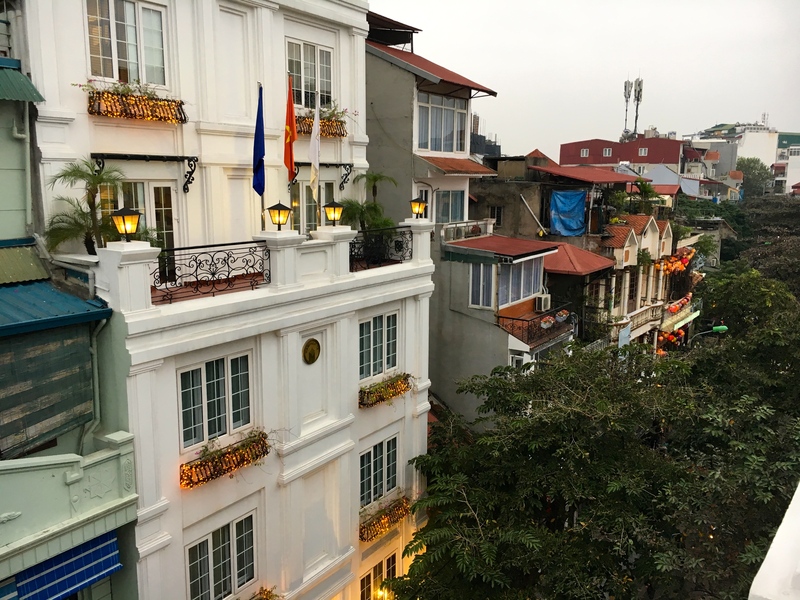 Hanoi 3B Hotel is a small boutique hotel in the center of the Old Quarter along one of the many narrow streets and within walking distance of almost everywhere we wanted to go. The staff met us at the door around 6am and although they couldn’t check us into our room quite that early, they were able to hold our luggage for the day. Now, after that cramped and bumpy night spent on the sleeper bus (see exactly what I’m talking about in our Hue article) our first stop was a local coffee shop. The city was really bustling that time of day and the pelting rain made for a dreary start. 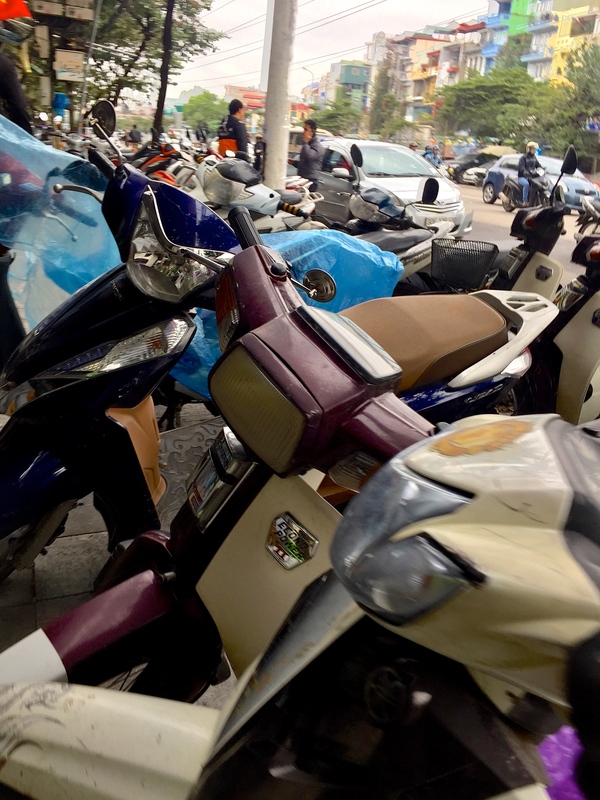 The narrow streets were filling up fast and we weaved in and out of the roadway dodging the puddles, the motorcycles parked on the sidewalks and the small storefronts spilling out to the street. Hoping to find one of the places I located on google maps prior to leaving the hotel lobby, we surely looked like we were on a mission. As with many places in this region, they come and go and google maps tends to be a little outdated for these small places. Even so, we eventually passed a tiny corner café that could seat maybe 8 people. They seemed to have just rolled up their doors as the barista was still setting up shop and laying out their tiny stools for guests. 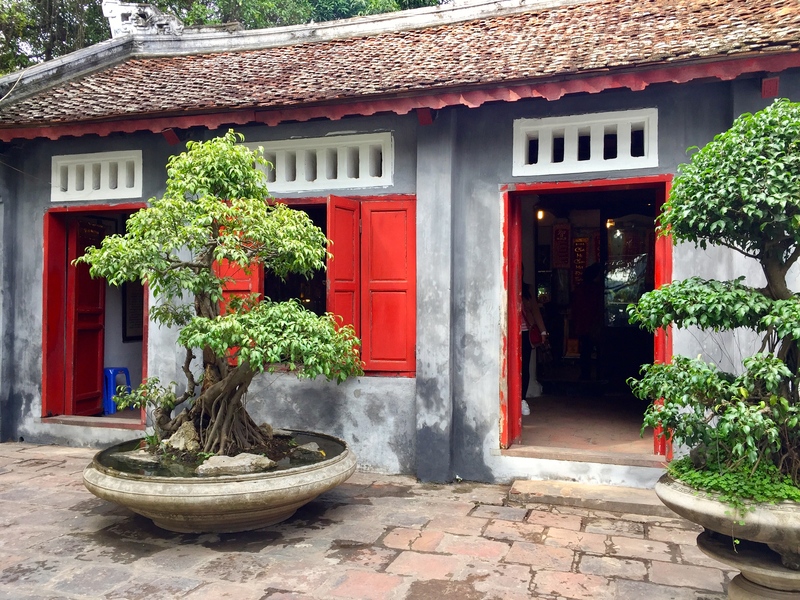 Before she even hands us the menu, I ordered two cafes eagerly wanting that soothing jolt of an authentic Vietnamese coffee. Wow, it was strong and bitter to say the least. Whitney, worried of potentially upsetting her stomach, only had a sip. I on the other hand downed them both, paid up, and set off to try another coffee shop on the other side of town with great reviews online. 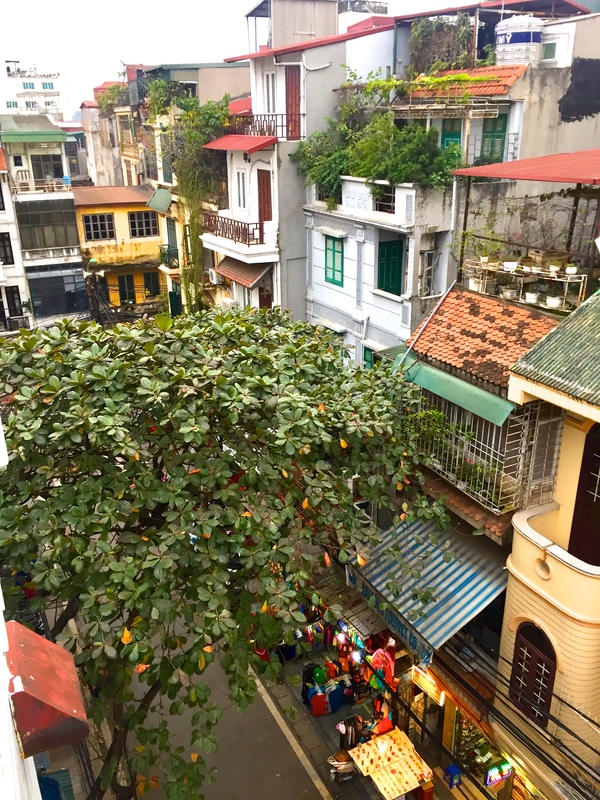 The rain showers chased us as we scurried along under overhangs until we finally found a piece of home in Hanoi. We entered into Joma Bakery Café a chain of cafes in Asia which resemble a Starbuck’s, but with a better menu to satisfy our appetites. Sipping on our favorite blends of coffee and indulging in a cream cheese bagel, I logged into the free Wi-Fi and felt like I was transported right back into any one of our spots in NYC. We were so behind on blogging and so ready to check in with family and friends back in the states that we ended up spending all day there. By ‘all day,’ I mean we had breakfast, lunch and even debated dinner, but eventually left around 5pm. Plus, we were looking forward to meeting up with our friends Kevin and Sarah from NYC who were arriving in town that evening. Thankfully, the rain had ended by then and we met up with our friends to head out for dinner. 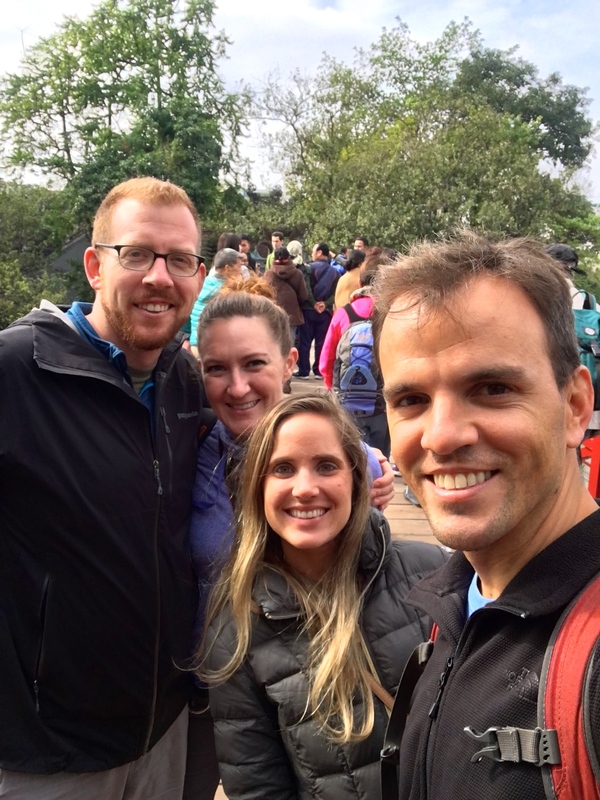 Unsure of where to go, we relied on our old faithful travel companion Southeast Asia on a Shoestring. 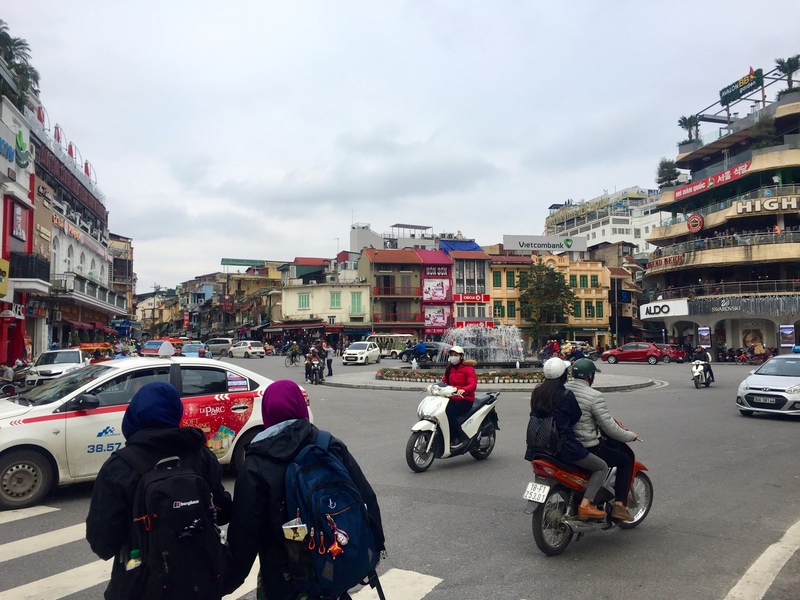 We looked over a few places and ended up choosing Cha Ca Thang Long. This restaurant has only a handful of items on the menu and is sort of a ‘do it yourself’ experience. We watched neighboring tables served the various uncooked ingredients for a tasty meal and then watch as they would toss it all onto a hot plate in the center of the table. Luckily, a staff member was used to tourists like us and helped get things moving along. It was definitely the perfect setting to snap us back from our day at the western café. The next morning we were up early excited to see the city. We had only one order of business to tend to, (getting our bus tickets to Cat Ba Island in a couple days), so we took care of that first. 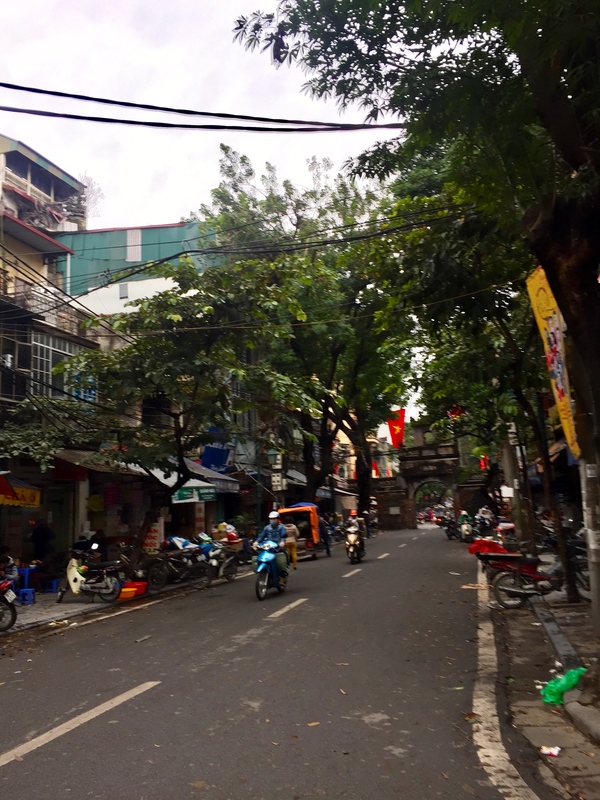 Next, we set off through Hanoi’s Old Quarter. 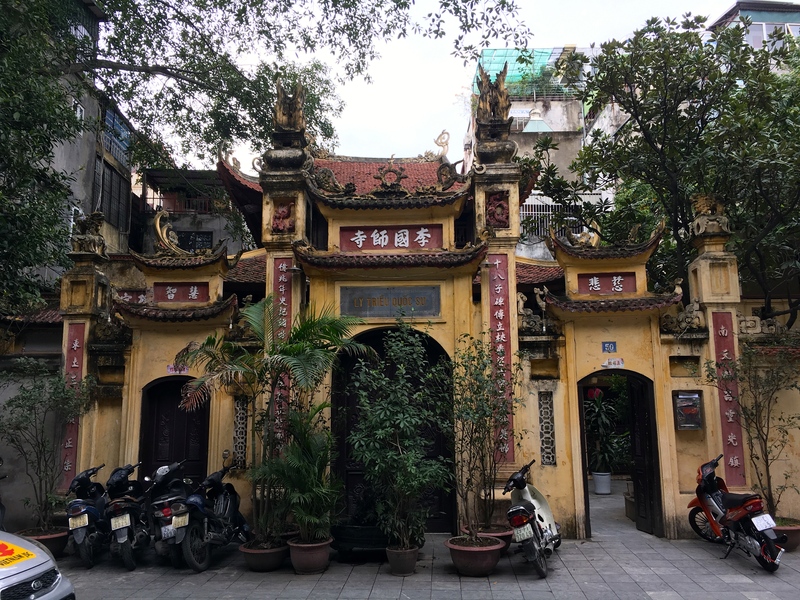 In many cities we have visited on this trip we found that the areas called ‘Old Quarter’ usually refers to a part of the city that has somehow become dedicated to tourism. Gift shops, souvenir shops, restaurants, and bars would cater to the tourists and locals would hardly venture into the area if they didn’t work there. Hanoi was very different though. 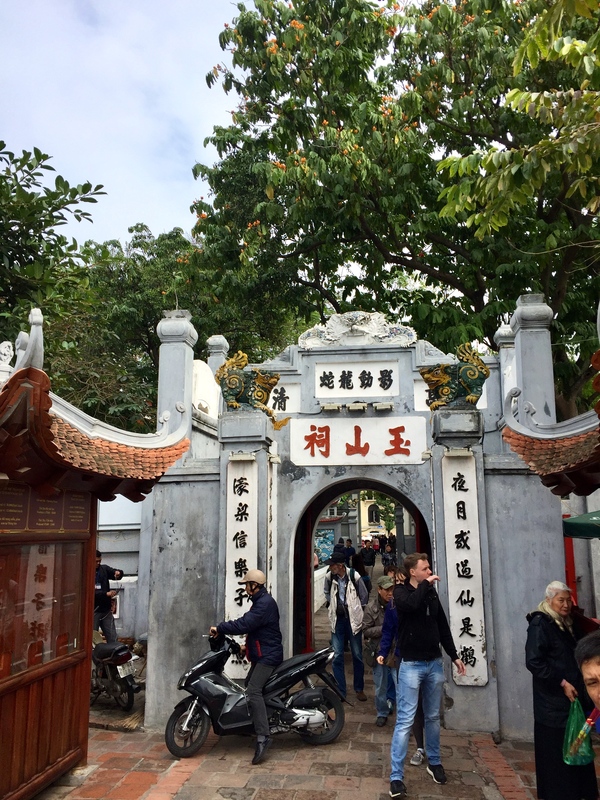 As we wandered through the “36 streets,” we were surrounded by locals doing their daily business alongside a smaller number of tourists. 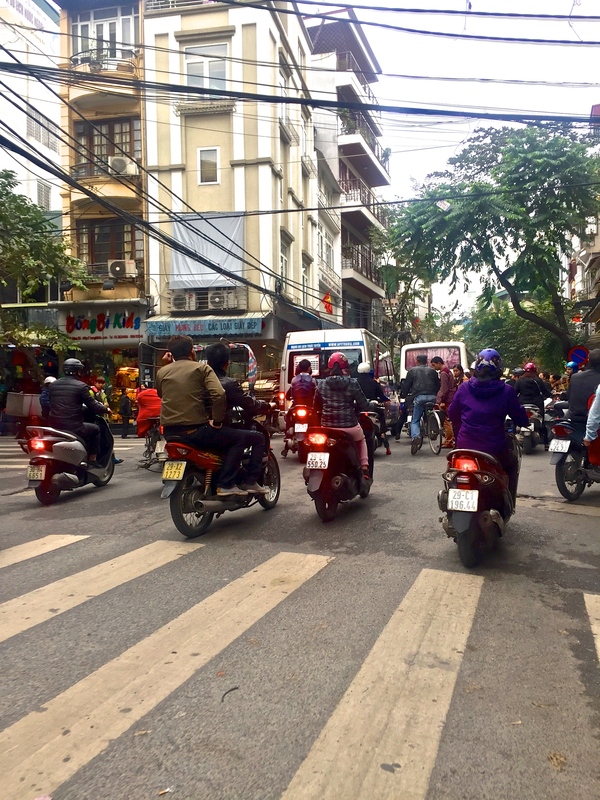 From the gentlemen getting a haircuts on the sidewalks, to the restaurants filled with locals, to the shops selling all the necessities of daily life, we remained the minority in this old quarter and locals on foot (and of course on motorcycles) filled the streets. 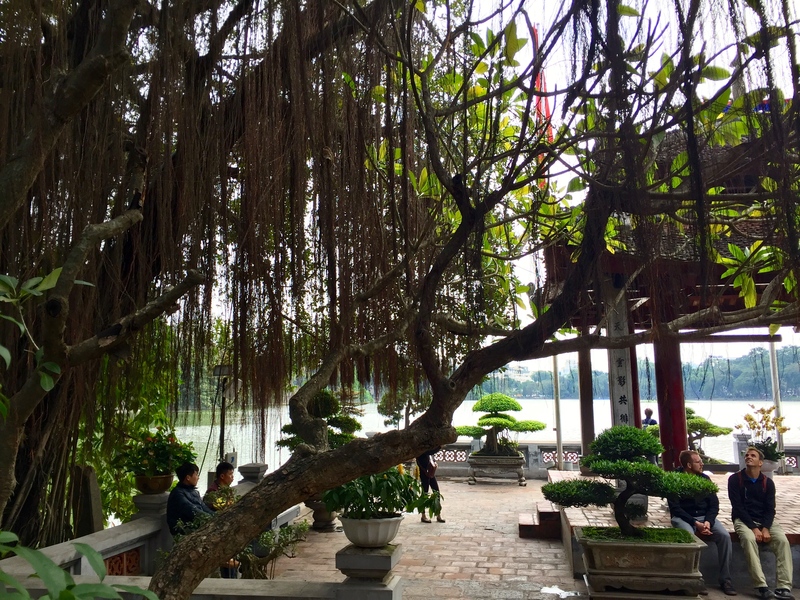 At the southern edge of the old quarter the streets open up to the picturesque Hoan Kiem Lake, “Lake of the Returned Sword.” Legend has it that when the people of Hanoi were fighting for freedom from the Ming Dynasty, a Giant Turtle came to the surface and offered Emperor Le Loi the magic sword that helped to defeat the Chinese. Later the Turtle resurfaced and requested the sword be returned and the lake was then renamed to commemorate this event. A Turtle Tower, Thap Rua, was built to honor the turtle. Interesting story, right? Anyway, it was a beautiful park surrounding this lake which made for some excellent photos from the shore. 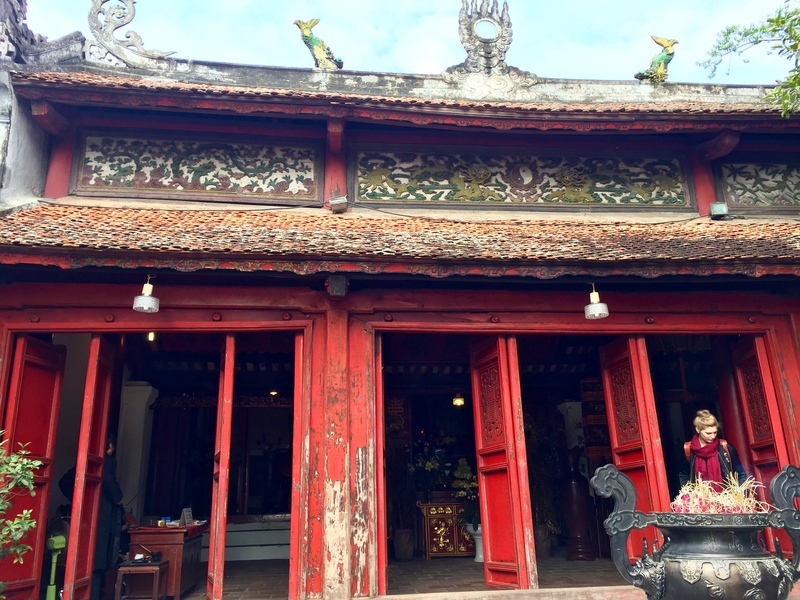 We then walked out to the Ngoc Son Temple on Jade Island dedicated to Confucian and Taoist philosophers. 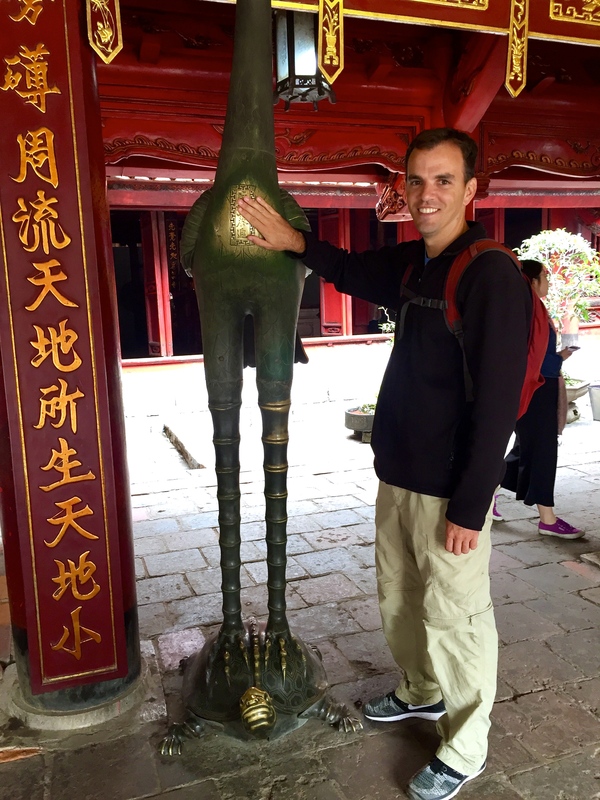 Of course, we took note of the turtle statues and sort of memorials. 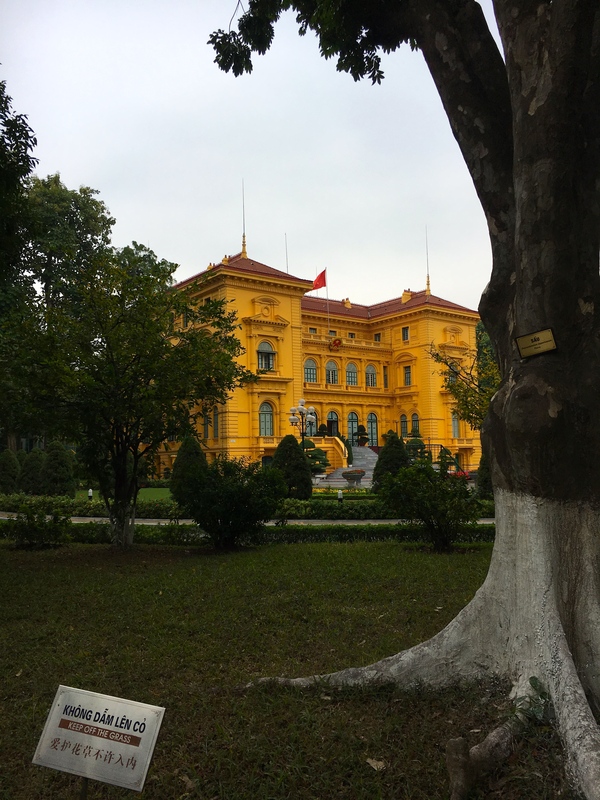 From there we thought it would be interesting to see the Vietnam National Museum of History. As might be expected a national history museum can be interesting for some, but after seeing so much about the Vietnam War over the last couple weeks I think I had already seen a version of the highlights. The museum would still be worth a visit if it’s the only one you see. 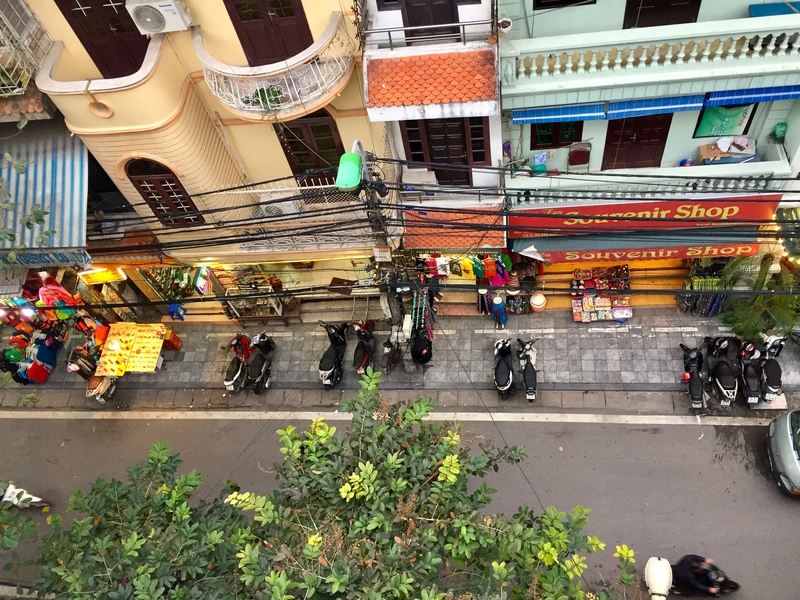 I, on the other hand, wanted to get back outside to the cultural hustle and bustle of Hanoi. After touring the museum Whitney and I were a little curious about the famed water puppet shows and thought we should make this an afternoon treat. We bought our tickets, but still had some time for lunch before the show. We have made it a point to go to the restaurants with the most locals packed inside because we’d assume it is the best choice. We passed by a small place that even had a line of patrons waiting to order. I eyed out a table that was getting up and made a b-line toward it. One of the staff noticed my quick move, cut me off and instead directed us to some stairs at the back of the restaurant and led us to an open table on the second floor. I guess they wanted to hide their tourists so the locals keep coming. Also, I do think we were in someone’s living room at this point, but they took our order and served a meal that was as incredible as expected. 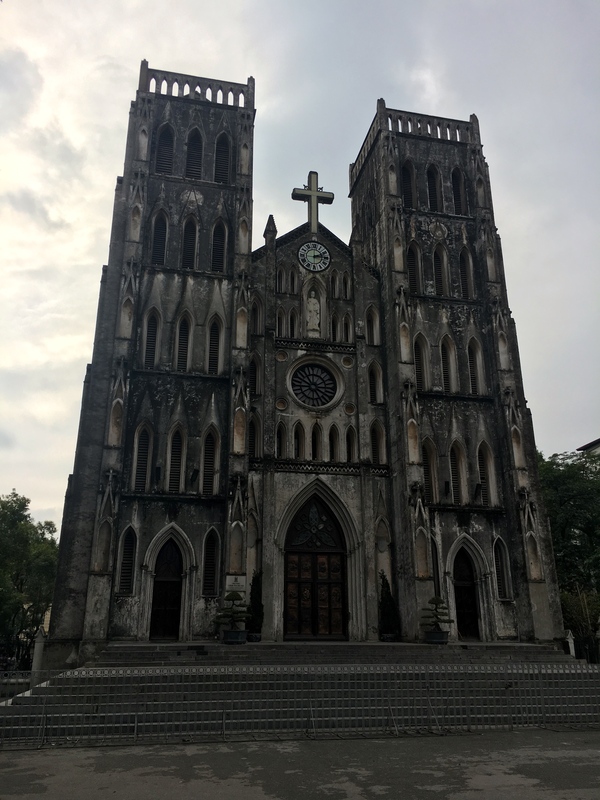 After lunch we still had a little time and took a few minutes to check out a Catholic cathedral built during the French occupation of Vietnam. 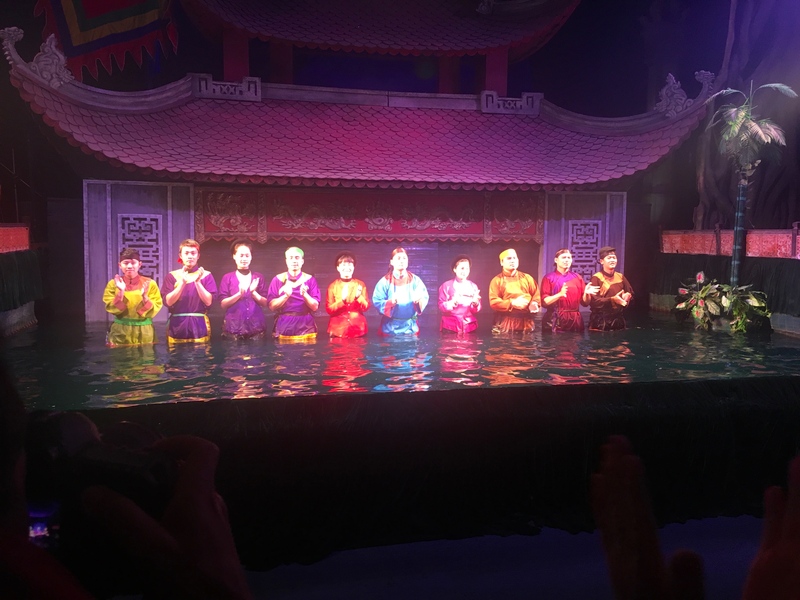 We then made our way back over to the water puppet theater. 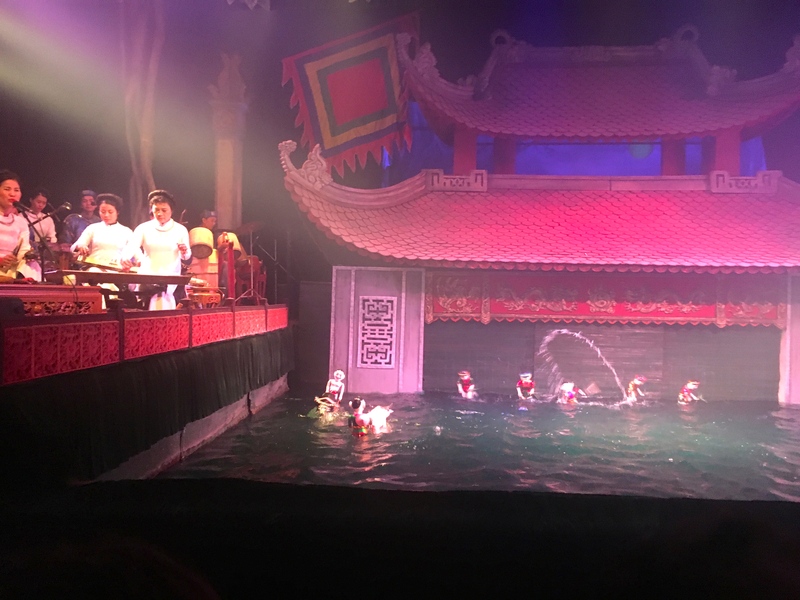 Alongside a bus load of Chinses tourists, we enjoyed the comical act put on by the puppeteers and as always the crowd of Chinese tourists with their massive cameras added to my entertainment. 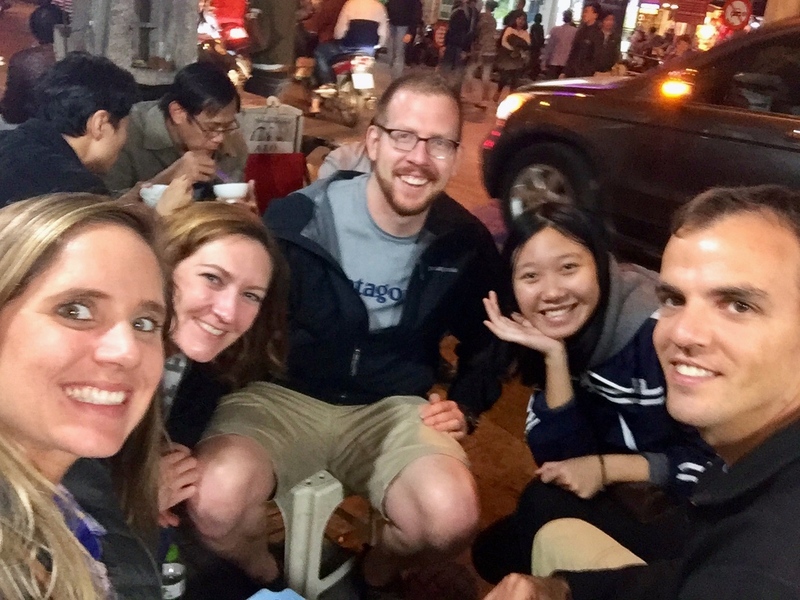 We finished off the night at a traditional Vietnamese restaurant called New Day that just so happened to be in our Southeast Asia on a Shoestring book and just up the street from our hotel. 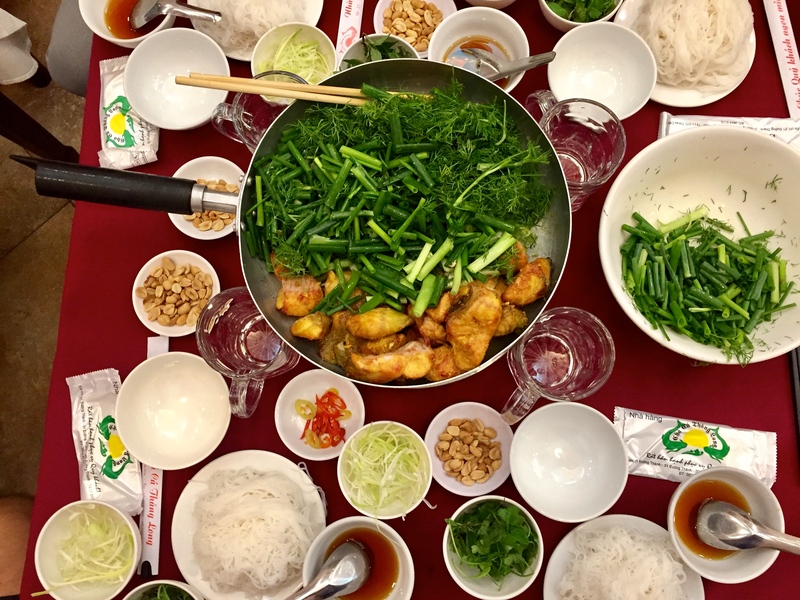 Additionally, we were meeting a new Vietnamese friend of Kevin and Sarah’s for dinner which allowed us get a local’s choice of dishes to satisfy our tastes. The next morning we had quite a day planned with a history tour in the morning and a food tour in the evening. 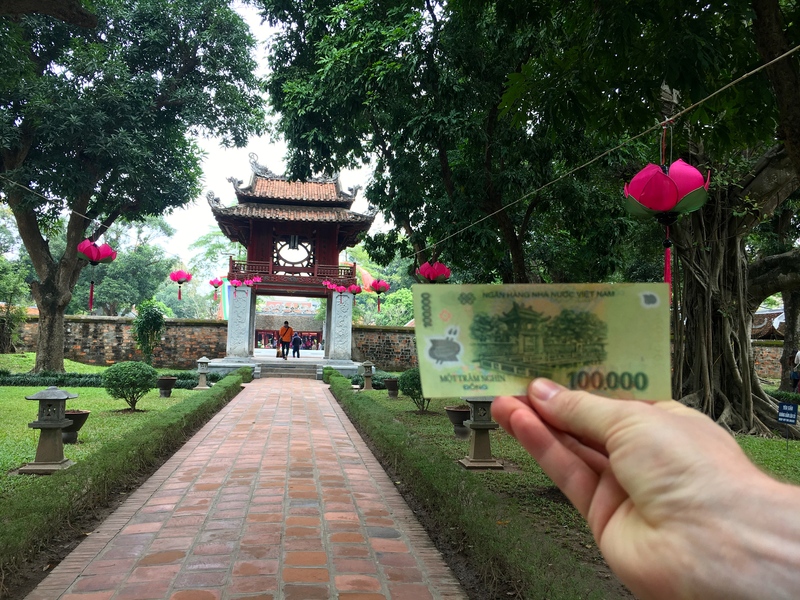 Both of these are a must do in Hanoi, I must add. 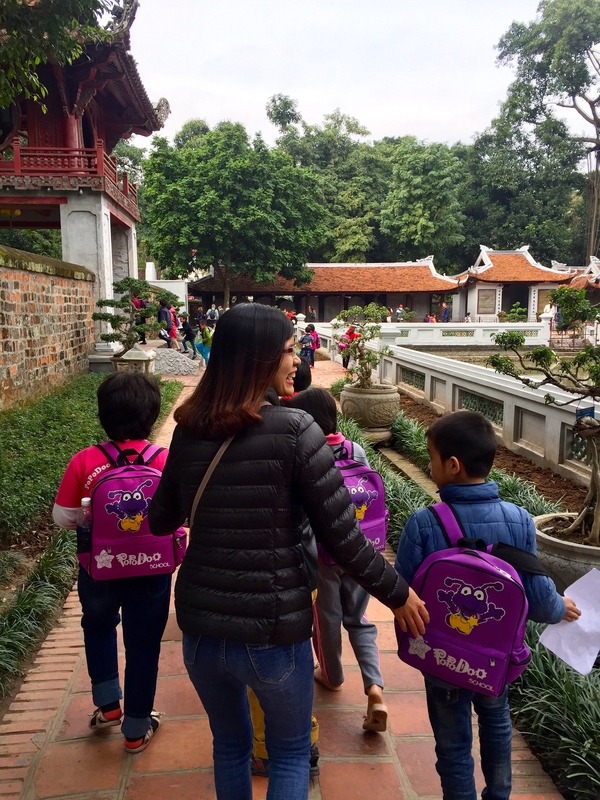 Thankfully, we were able to work with Hanoi Free Tour Guides with a last minute booking. This non-profit organization founded in 2010 connects student and tourists to achieve a great mission of improved communication and cultural exchange in addition to supporting to the tourist industry, employing young people to develop their skills and finally contributing to community empowerment. This highly recommended company connected us with Phuong, the sweetest guide we have ever met who was so excited to show us around. 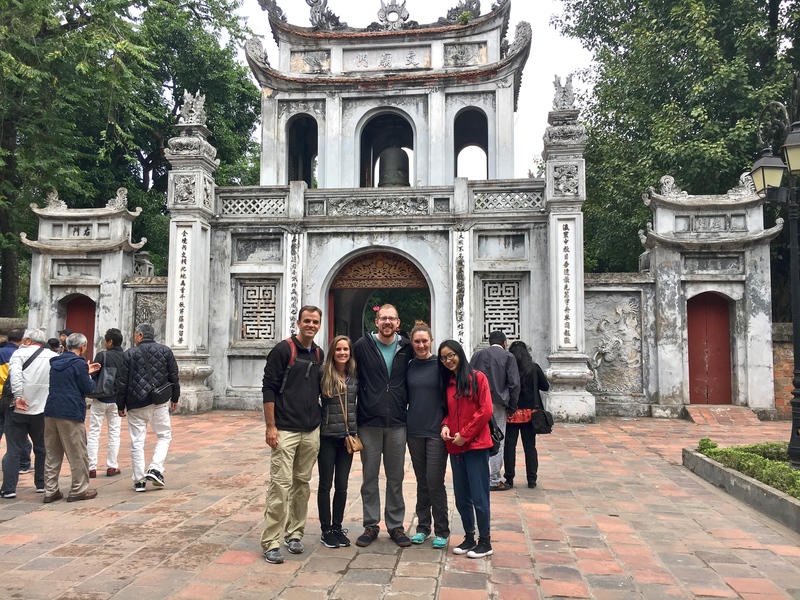 We met Phuong near Ba Dinh Square, got a quick introduction to the city, and then jumped in line for tickets to our first location. While in line she offered a plan for the day and then described what we were about to see. I honestly didn’t know that much about the history of Vietnam other than the war, so it was all interesting to hear. 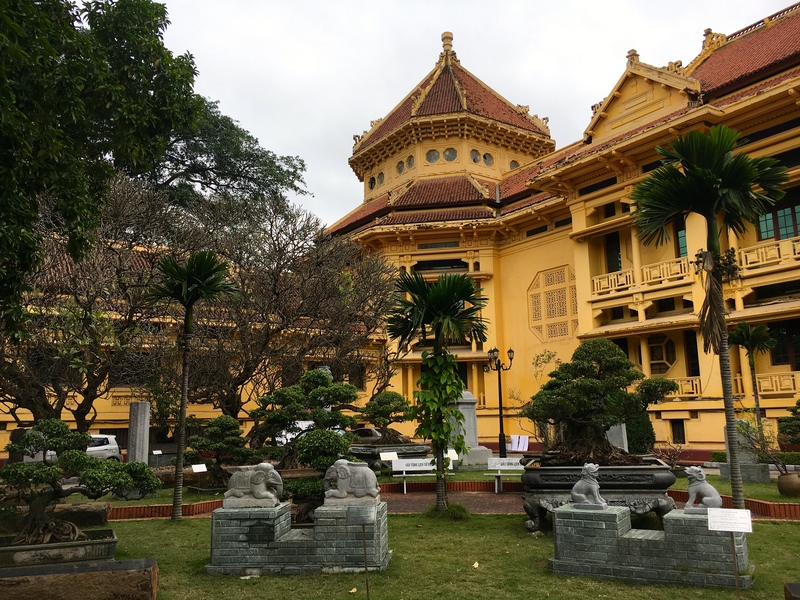 We passed beyond the ticket booth and through the gardens until we were looking up at an enormous, bright gold facade of another remnant of French colonialization and French Indochina. This gorgeous Presidential Palace looked like so many of the places we had seen passing through France and Europe. 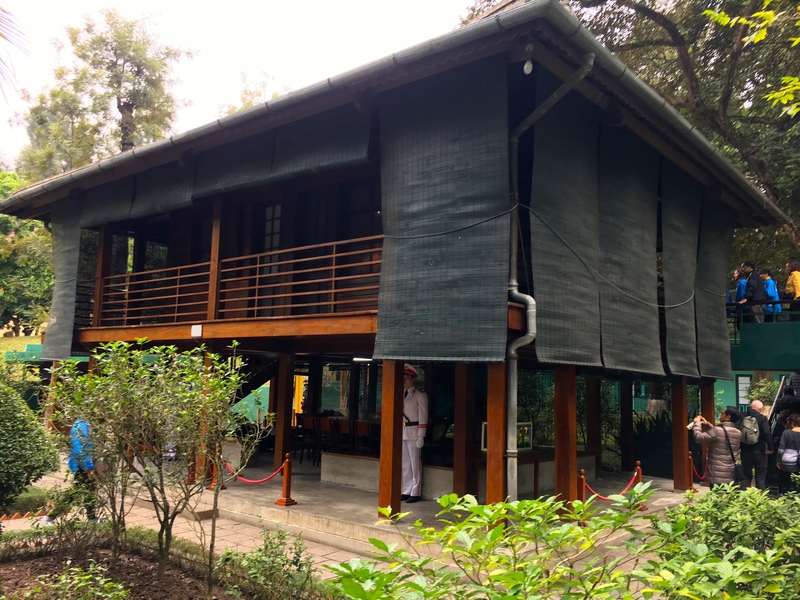 However, what I found most interesting was that the first president of Vietnam, Ho Chi Minh refused to live in this grand residence for symbolic reasons and chose only to receive guests there. Instead, he built and lived in the simple stilt house nearby on the edge of his carp pond. We continued along as she pointed out and described everything we were seeing. 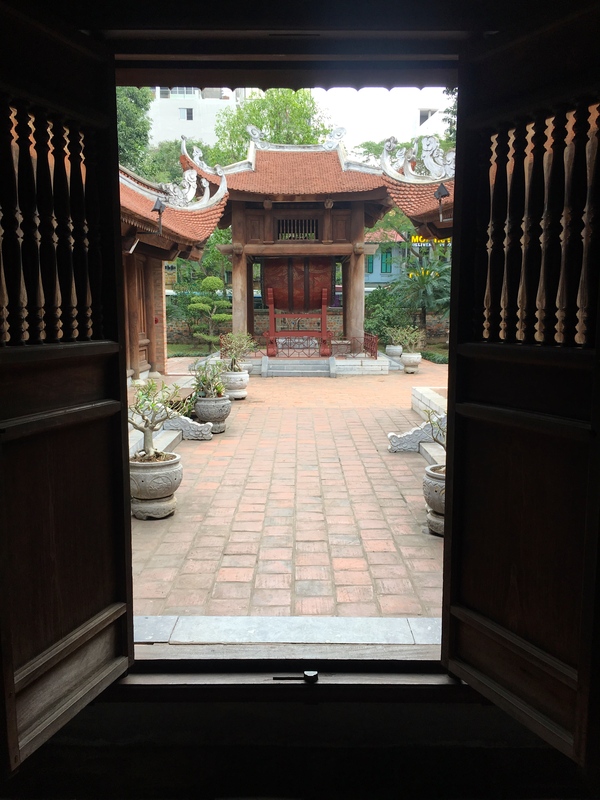 Later, as we neared the Mausoleum itself, we were discretely reminded to keep silent as we entered the mausoleum and passed by the well preserved body of Ho Chi Minh. It was quite interesting to see, but I have to say it felt a little eerie to be sort of inside a man’s grave. 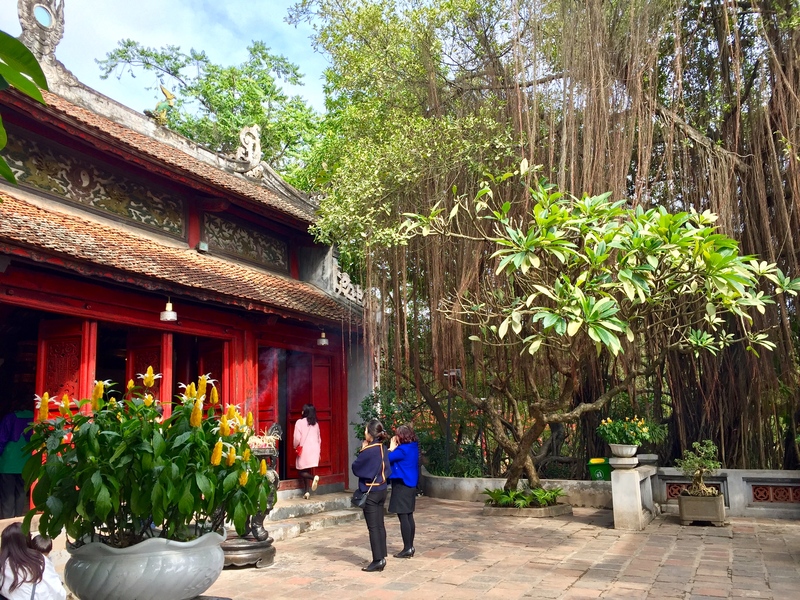 Next, we walked across town to the Temple of Literature. 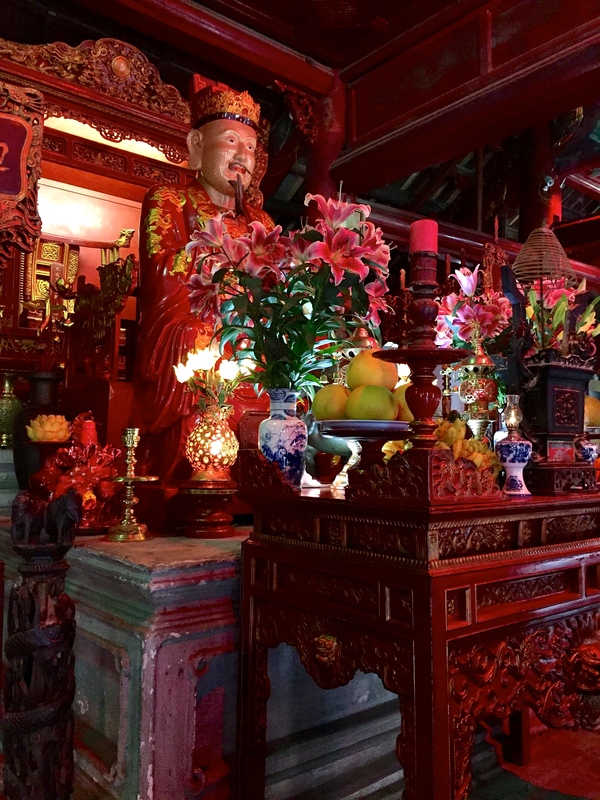 This Temple of Confucius hosts the Imperial Academy, Vietnam’s first national university. We entered into the complex intrigued by the series of courtyards each with its own purpose. 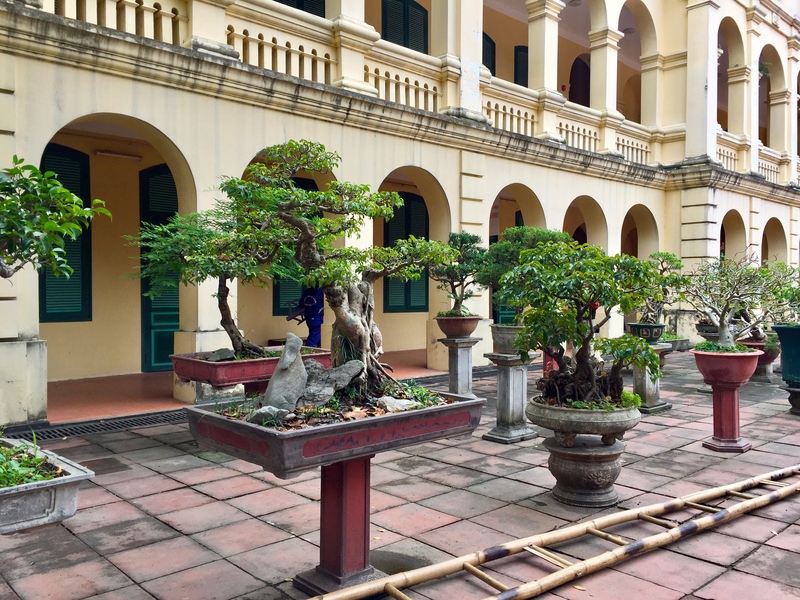 Beginning with a simple garden where scholars could relax away from the bustle of the outside world progressing through each gate to the Fifth Courtyard and the Imperial Academy itself. 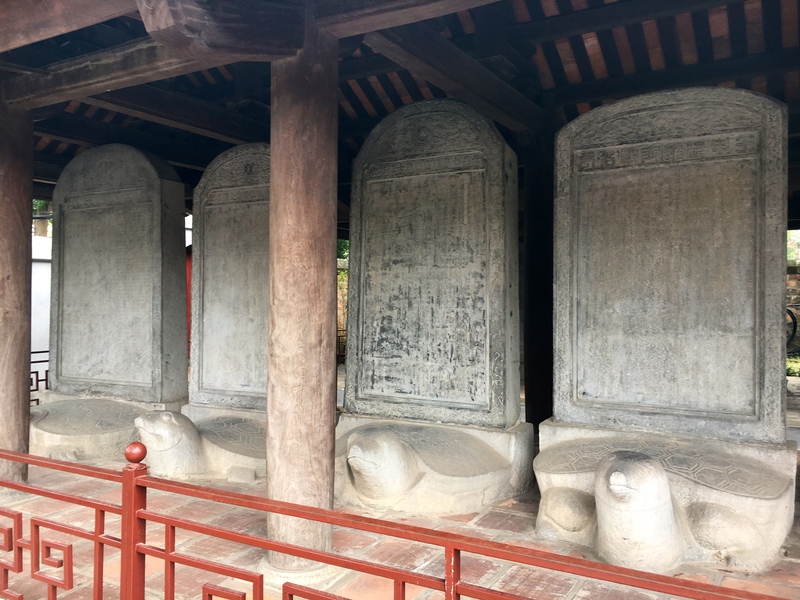 My favorite part was Stelae of Doctors with the massive stone carved turtles. 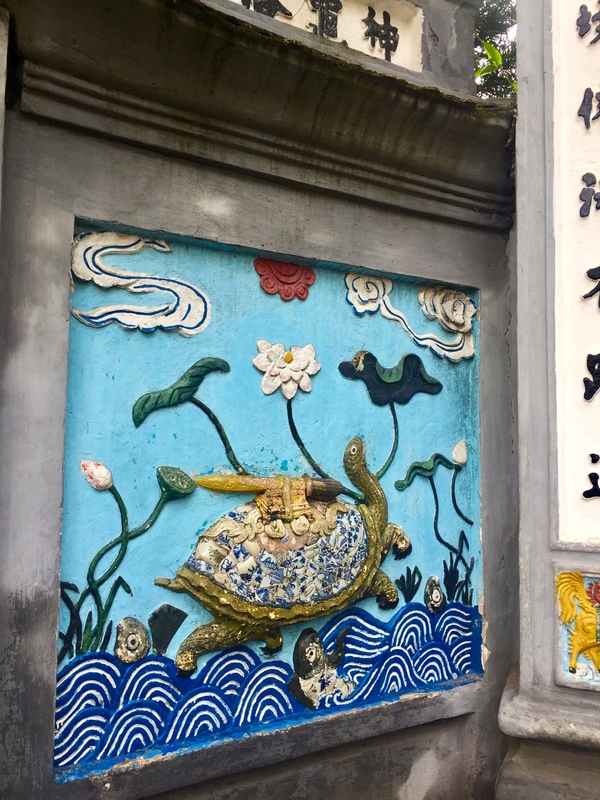 These turtles, as a symbol of wisdom and longevity, honor talent and encourage study. 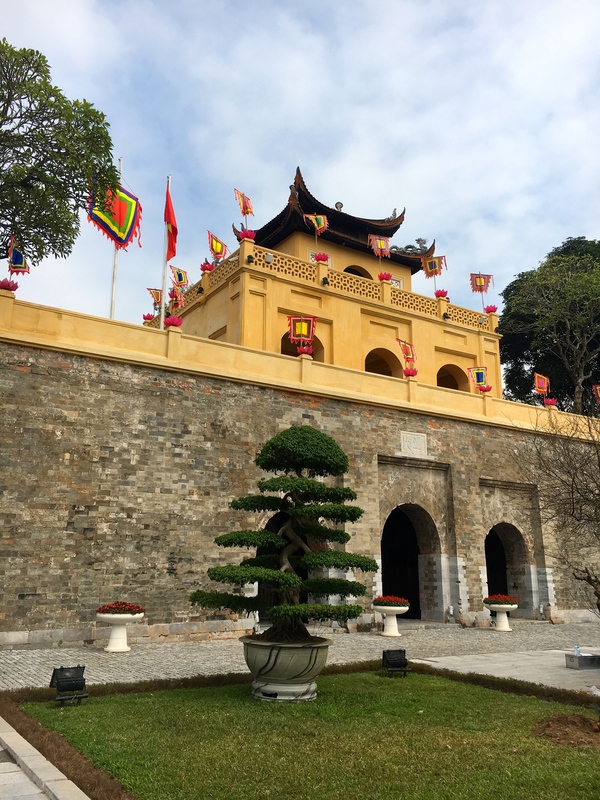 The final destination on our tour was the Imperial Citadel of Thang Long. This Citadel served as the regional political center for almost 13 centuries. 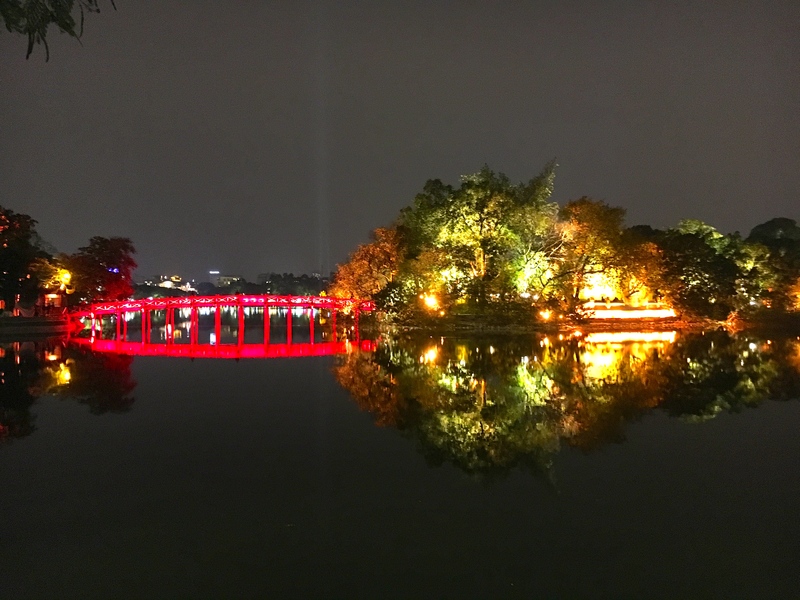 Much was destroyed during the 19th and 20th century wars, however, it has become a UNESCO World Heritage site as of 2010 and efforts are being made to excavate, rebuild, and restore more of it. This was worth touring and I think definitely needed a guide. We entered the massive gates of the complex toured a few of the buildings and took a number of photos of one of the best Bonsai collections I’ve ever seen. Finally, if you are wondering, the free guides arranged through this company are not allowed to accept tips. So, we did the next best thing and had our guide choose a restaurant and we treated her to a tasty lunch of her choosing. Yummy lunch with our guide! 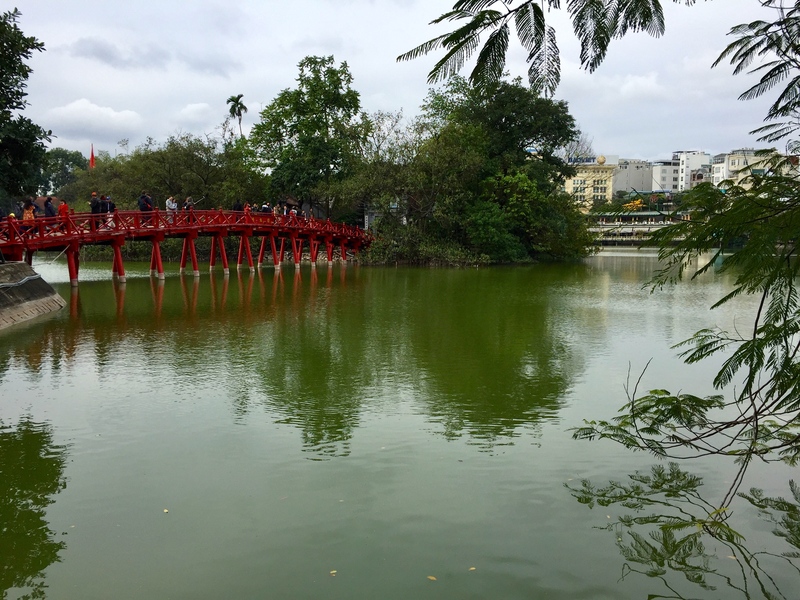 Having been on our feet for most of the day, we took a little time to relax for the rest of the afternoon and made plans to meet up with our friends later for another must-do in nearly every city in Vietnam. Whitney’s idea of relaxing included taking more selfies from our hotel room balcony capped off by a 1 hour yoga session in our warm and toasty hotel room. 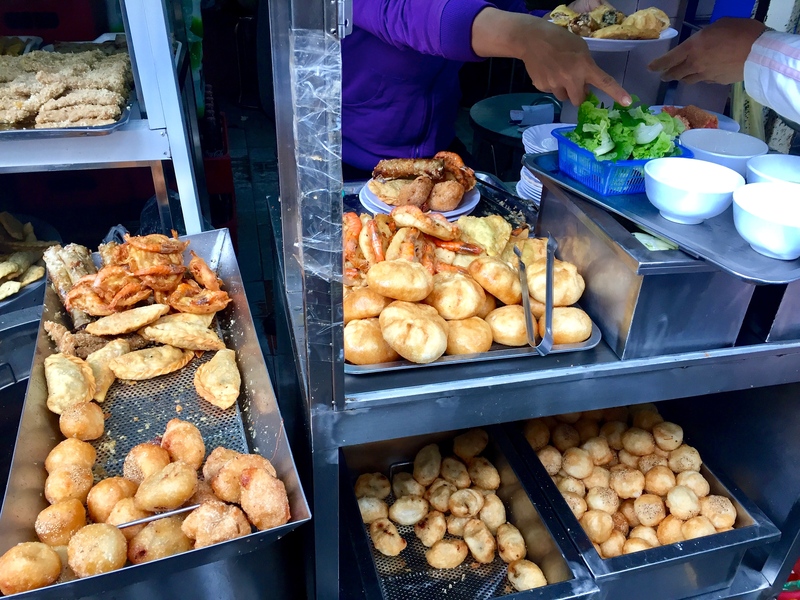 Similar to our experiences in the last couple stops on our journey through Vietnam, we had to find ourselves another food tour of course. Early that evening we met our Food Tour Guide at a local restaurant hidden in an upper floor of an establishment. From there we were on the right track as we moved from restaurant to restaurant sampling the best things, often the only thing on their menus. Come to think of it, most of the places we went to didn’t even have a menu, they only served the one item you see when you arrive. That’s how you know it’s authentic! 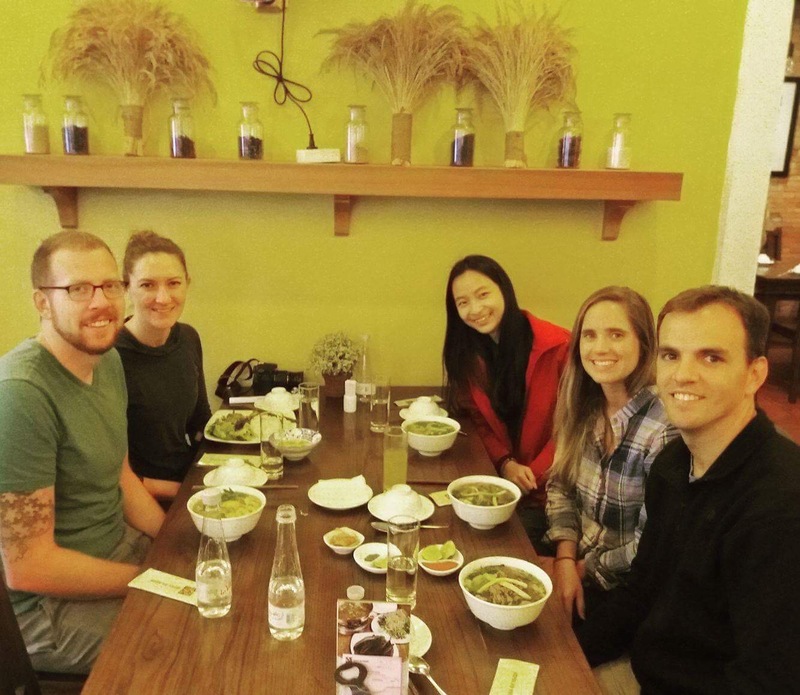 It went a little something like this…we began the tour with a small soup, progressed to some tasty dumplings, stopped for a delicious Bahn Mi, and relaxed with some soothing tea. We even had a dish at the restaurant we had selected for lunch the day before and once again sat upstairs in the living room. We finished our night far beyond satisfied, i.e. 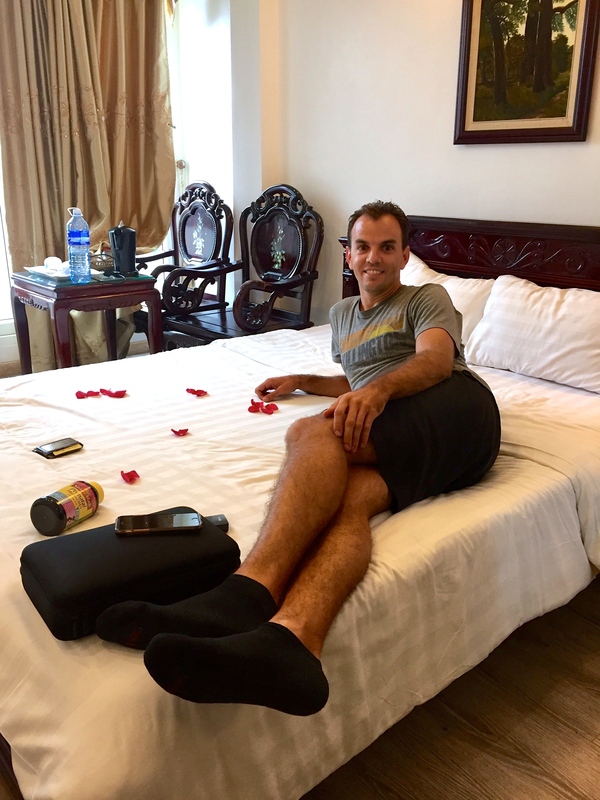 stuffed, with a sweet tapioca tea and crawled back into the hotel to pack for the early morning trip to Cat Ba Island. 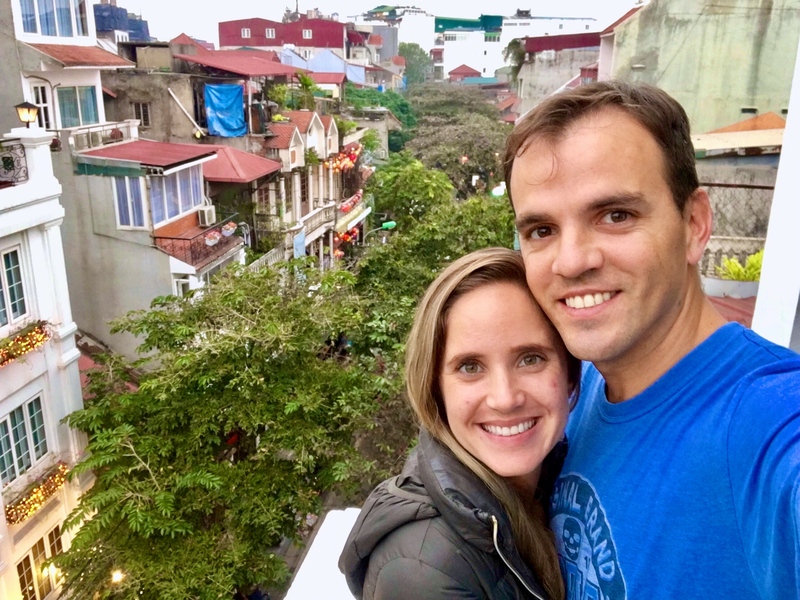 We did have one final half day to spend in Hanoi before leaving Vietnam for our 25th country on this journey. 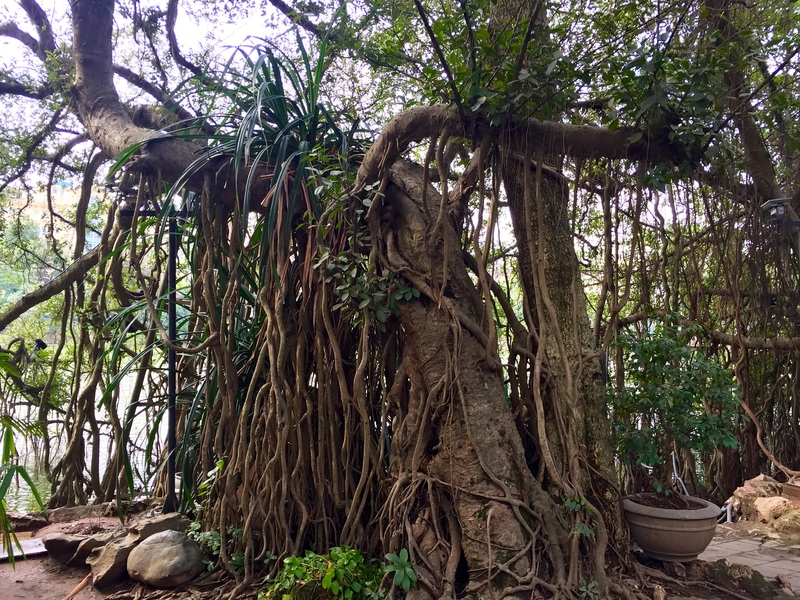 Our round-trip ticket to Cat Ba Island got us back to Hanoi in the early afternoon where we decided to check back into the same Hanoi 3B Hotel. Once in our room we listed out our errands before jetting off. First, we needed to get laundry done and through a quick search I found a spot not far away. It was a tourist booking agency that somehow connected themselves to a laundry service that was capable of getting it done within a couple hours (well worth the cost). 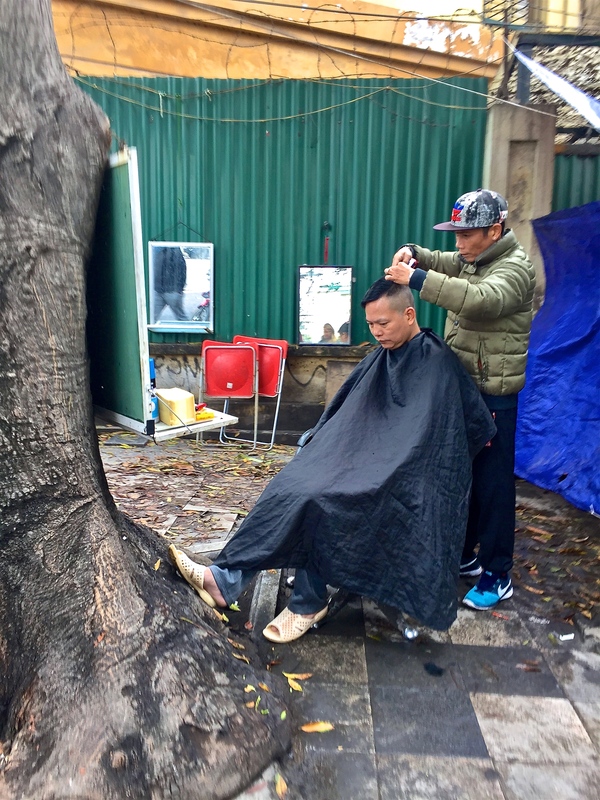 This not only allowed us to get a welcomed cheeseburger at a nearby restaurant, but it also gave me time to get a haircut and one last hour long Vietnamese massage. There are some things I’ll miss more than ever and the Vietnamese and Thai Massages are definitely at the top of the list. 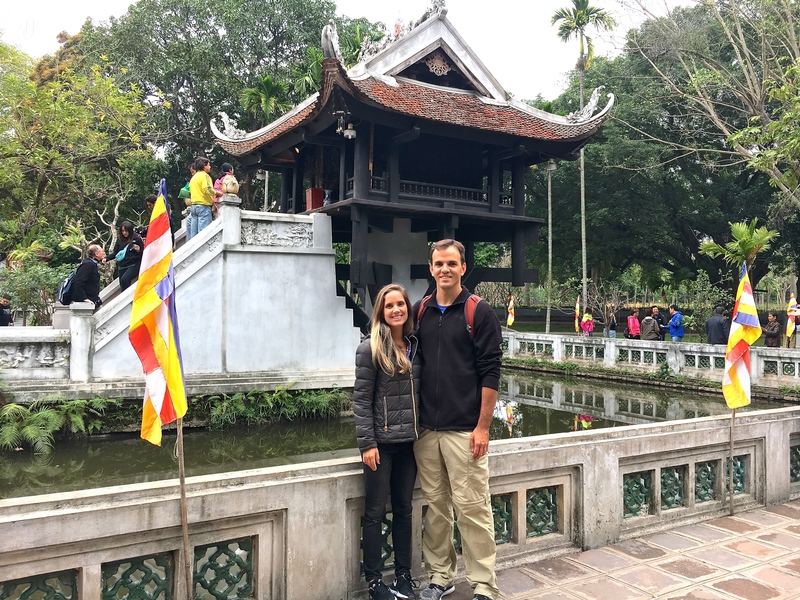 The next morning, after almost a month of touring Vietnam, we set off early to catch our flight to Malaysia, where managed to squeeze in an incredible scuba diving adventure at Mabul Island and hope you follow along to our next destination. 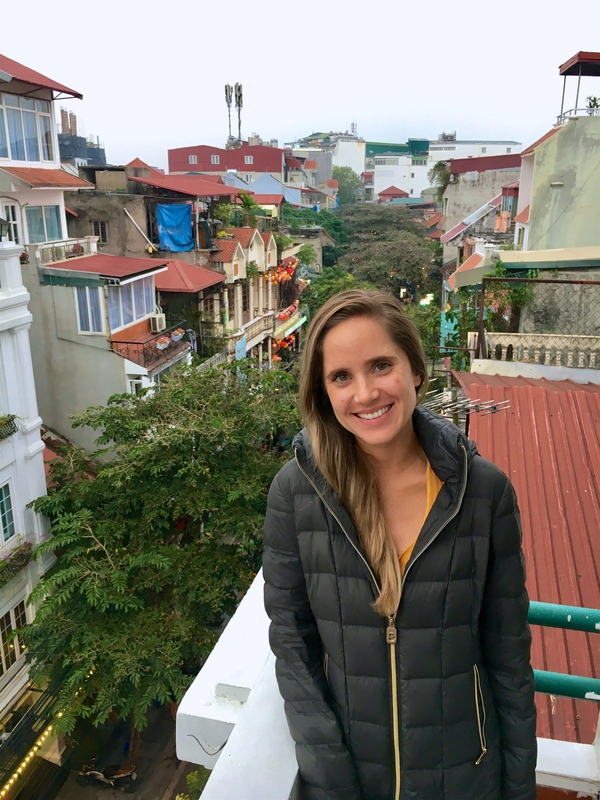 Next articleHow Can Budget Backpackers Afford a Trip to Ha Long Bay?